For beginning Web designers who wish to leave behind the confines of simple, template-driven apps like Apple’s iWeb (part of the $79 iLife suite), Karelia’s $49 Sandvox, and Realmac Software’s $49 RapidWeaver, the software you’re most often told to buy is Adobe’s $399 Dreamweaver and either Fireworks ($299) or Photoshop ($649). Freeway is a huge step up from Nvu as far as WYSIWYG editors goes. You build your layout by moving objects and text around on the page, add links, and can even apply image effects like blur, sharpen and more to your images (with full transparency support). Getting images, audio and video into your layout is easy with iPhoto, iTunes and Extensis Portfolio integration, and of course drag-and-drop is fully supported as well. One of the coolest features is the ability to apply graphic filters on text on a character level, while still maintaining edibility within Freeway. That’s because Freeway doesn’t actually create the image and apply the graphic filters until you publish the site, leaving you with more time for experimenting with your design rather than switching back and forth between applications and waiting for FTP uploads. Freeway Express sells for $89 for the downloadable version and $109 for the CD. 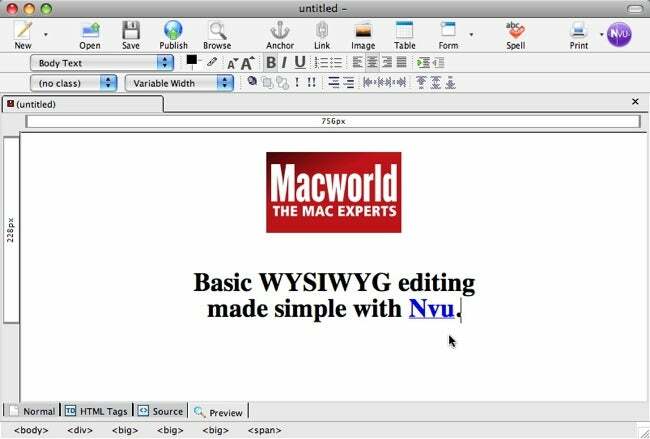 If you’re looking for a full-featured Web editor, Freeway is an excellent first step. Softpress also offers Freeway Pro, which ads numerous features for $249 ($289 on CD). Downloadable demos are available for both products. In my follow-up later this week, I’ll introduce you to some helpful tools you can use to design your site, as well as track your site’s popularity—all which will work with whichever Web editor you choose.